These file photos show the headquarters of the Sinclair Broadcast Group in Hunt Valley, Maryland (left), and the studio of Tribune Media Company's WGN television studio in Chicago. The $3.9 billion buyout of Tribune Media by Sinclair collapsed Thursday, ending a bid to create a massive media juggernaut that could have rivaled the reach of Fox News. Sinclair used "unnecessarily aggressive and protracted negotiations" with the Department of Justice and Federal Communications Commission over regulatory requirements, the Chicago company said, and it refused to sell the stations it needed to in order to gain regulatory approval. 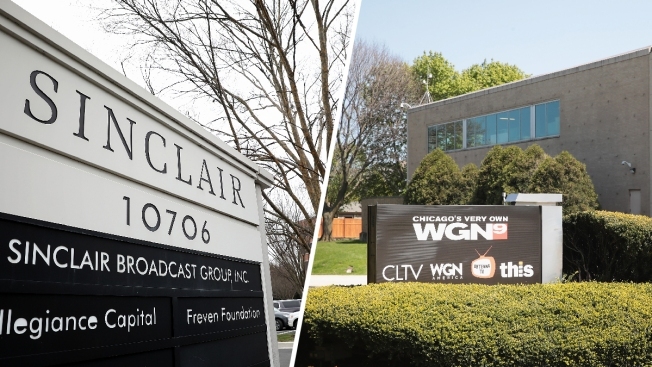 Sinclair Broadcast Group wanted the Chicago company's 42 TV stations and had initially agreed to dump almost two dozen of its own to score approval by the FCC. The Maryland company said Thursday in a prepared statement that the Tribune lawsuit is "entirely without merit." "We unequivocally stand by our position that we did not mislead the FCC with respect to the transaction or act in any way other than with complete candor and transparency," said CEO Chris Ripley.